We’re white British Northerners, but our tastes are very multi-cultural. Our close neighbours and friends are from South America and we just love the endless Spanglish conversations about food. We’ve had the most amazing foodie weekend – we kicked off this morning with hot chocolate and tamales. So to follow for Sunday lunch we made Peruvian pork and Papas a la Huancaina. 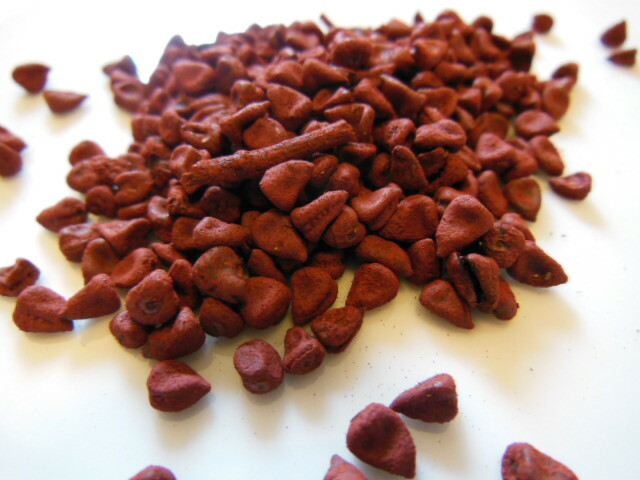 One of the flavourings in the pork is annatto (pictured above). This is used both as a spice and a dye, it is also known in Latin America as achiote. The small annatto seeds are brick red and triangular and are available whole or in a paste. In London you can buy them in the Latin American shops in Elephant and Castle. The dried seeds are heated in oil or water, which after the seeds are removed, is then added for a mild andpeppery taste. You could substitute paprika. 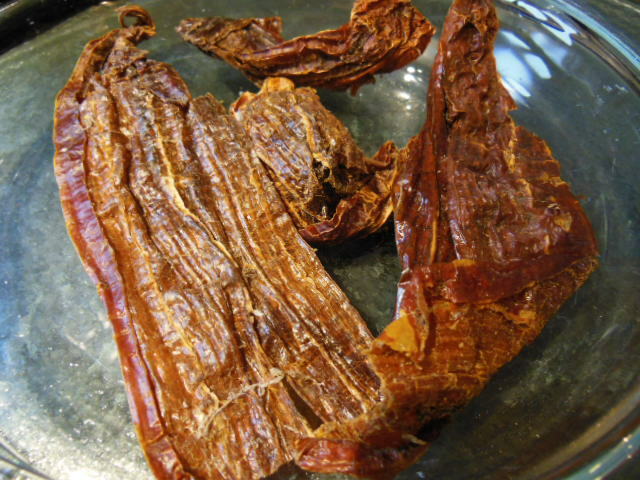 The other unfamiliar ingredient is dried Amarillo Aji Peruvian chilli (above). Again you can buy these in Latin American shops. They have a warm rich flavour. We tried Scotch Bonnett peppers in this sauce before which were too hot, so maybe jalepenos would be ok if you can’t find these dried chillies. The pork was from E17 Sunday Farmer’s Market from the Woodhouse Farm stall selling pure breed and traditional meat. We bought a piece of shoulder of pork (Tamworth cross) weighing just over a kilo for £6.79. 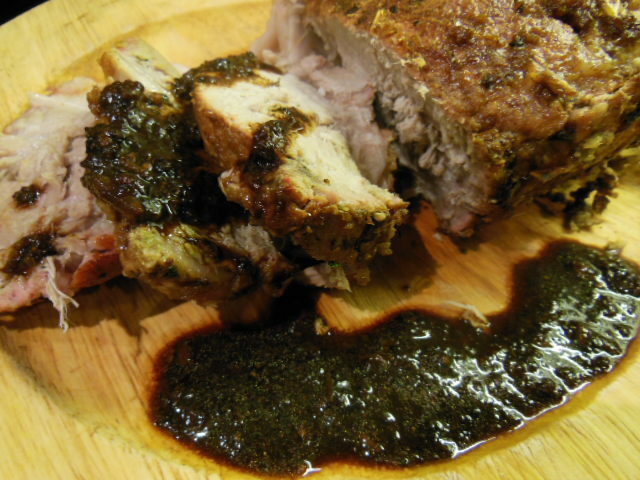 Place the pork in a roasting tray and rub in the annatto oil, cumin, salt and pepper. Soak the dried chillies for a few minutes in hot water to soften. In a food processor, blend to a paste the onions, garlic, and chillies with the vinegar and water. Add this to the pork and marinate for at least an hour and up to 24 hours in the fridge. Heat the oven to the maximum temperature, put in the pork covered in foil. Reduce the temperature to gas mark 5. Roast slowly for 1 ½ – 2 hours, adding water to the tray to prevent the juices burning, until it is cooked all the way through and the juices run clear when a skewer is inserted into the thickest part of the roast. To serve with the pork we had another classic Peruvian dish but given an E17 twist to suit the wintery, wet day. Papas a la Huancaina – roast potatoes with a spicy cheese sauce. We also had Cavolo Nero cabbage and roast cherry tomatoes from the market. Huancaina sauce is typically served over cold sliced potatoes. Made with those Peruvian Amarillo Aji chillies again, it is a versatile sauce that we first tried in the Soho Peruvian restaurant Ceviche served with grilled asparagus. It goes great with many vegetable dishes as a dipping sauce; you can adjust the heat by using fewer or more chillies. Soak the dried chillies in hot water for a few minutes to soften. Put all the other all the ingredients into a food processor, add the drained chillies and blend until you have a smooth sauce. Adjust as necessary – a little more milk if it’s too thick, another couple of crackers if it’s too runny. The sauce should be fairly thick, the consistency of a smooth dipping sauce rather than a paste or a thin gravy. Serve warm, at room temperature or chilled depending on the weather and your mood. This entry was posted in Recipes and tagged Achiote, Amarillo Aji, Annatto, Huancaina sauce, Latin America, London, Papas a la Huancaina, Peru, Peruvian cuisine, South America. Bookmark the permalink.